Wiz Khalifa’s trajectory in his rap career has always been about representing where he came from and staying true to who he was to his fans. Often chanting “Taylor Gang” in his songs, the name derives from both the name of his high school and iconic Converse Chuck Taylor. It’s only fitting that the rapper continues his partnership with Converse for their second sneaker collaboration. “I am very excited about continuing my relationship with Converse and releasing this new sneaker collection,” says Wiz Khalifa in a statement. “We spent a lot of time designing each part of the Converse Chuck Taylor All Star ILL and the end result is exactly what I wanted.” The sneakers arrive in two colors—a dominantly black version and dominantly white version—to remain clean and classic. 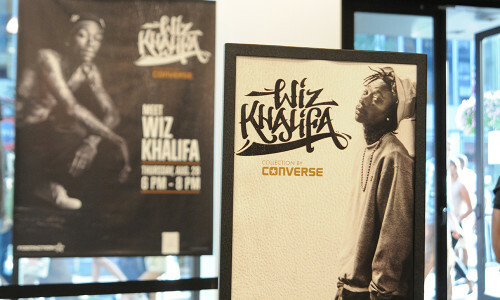 Wiz Khalifa made an appearance at the Footaction in New York City last Thursday to launch the shoe, shake hands with fans and continue to strengthen the Taylor allegiance. Check out the video above to see the recap of the party, which had a long line of enthusiastic supporters wanting to meet the man himself. Print article This entry was posted by hhcblog on September 3, 2014 at 7:32 am, and is filed under Footwear. Follow any responses to this post through RSS 2.0. You can leave a response or trackback from your own site.